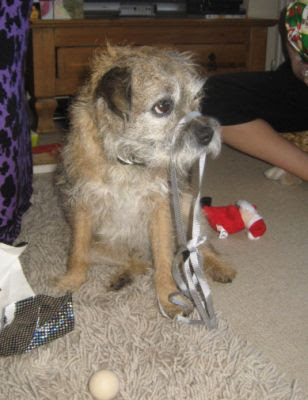 Christmas Day and Harry has just opened his present, a little Santa Claus. When he tried to give it a squeeze, it started to play a little tune, and then to sing "I wish you a Merry Christmas." After that Harry went back to playing with his golf ball. 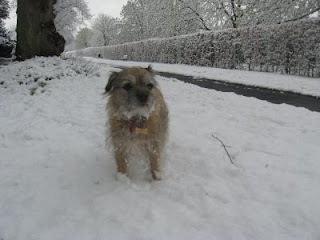 I've just been reading a pets advice blog on keeping your pet safe during the Winter Holidays. 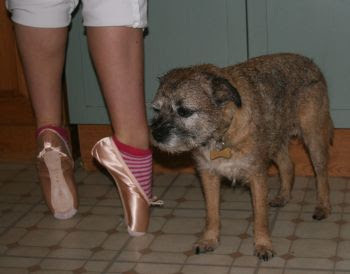 It says "Older dogs may not be as sure-footed on ice... If an older dog slips on the ice, he can actually tear ligaments between its legs and cause very severe problems..."
Harry did tear a ligament when he was much younger while trying to catch a frisbee and landing awkwardly. 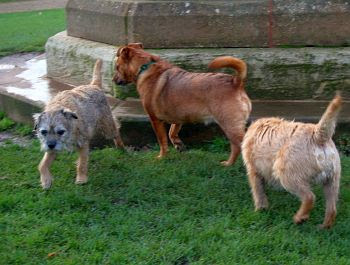 Here are Harry, Red, and Angus, taking it in turns to leave a mark on the Albert Monument. 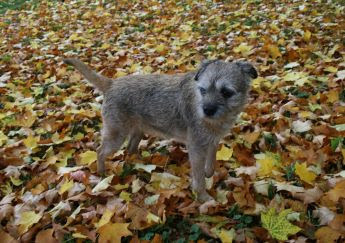 Angus, like Harry, is a Border Terrier, and a few months younger. 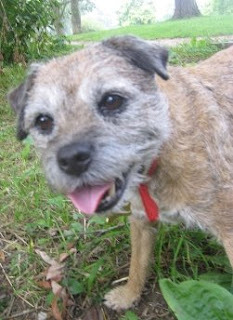 We used to meet Red out with his owner when Harry was a puppy, and they were contemplating getting a Border. Harry has seen Angus on and off for many years. And although I say excitedly 'Harry there's Angus!' they barely acknowledge each other. 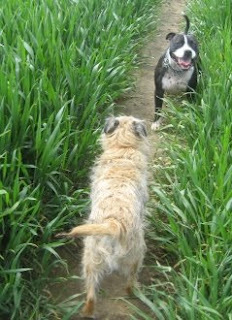 Its a doggy mystery why dogs get excited to meet some dogs and ignore others. 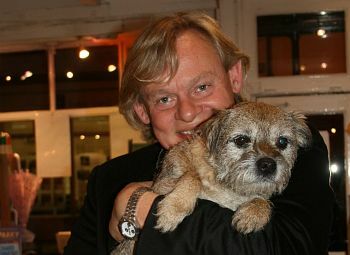 I'm not sure Harry is the same dog after meeting Martin Clunes. All that wolfy wolfy talk has gone to his head. 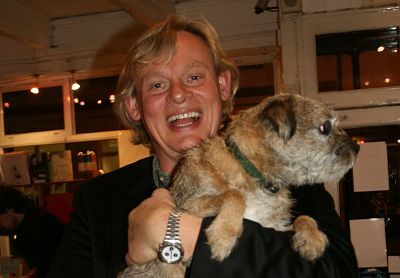 Martin Clunes recently made a documentary series about dogs, and has written a book based on his own family life with dogs called "A Dog's Life". When Harry saw the billboard outside he knew that this was one book signing he did not want to miss. He was not to be disappointed. 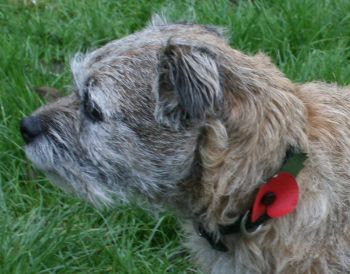 Martin knew about Border Terriers, and knew lots of other things besides. All about Harry's great great great ancestors the wolves, and the painted dogs in Tanzania. Man! those dogs know about behaving badly. 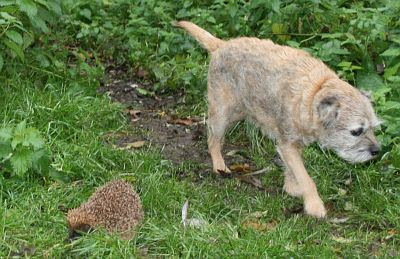 Harry knows better than to sniff or play with a Hedgehog. That thing can hurt! 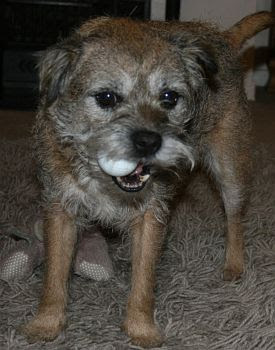 This golf ball is Harry's favourite toy. Roland Rat was dead before he got there. To some people this is the autumn, and to others it is fall, but to Harry its a time when he can easily loose things among the leaves. Today he has lost half a leg. He is looking around wondering "Where did it go?" 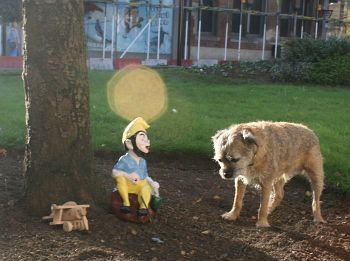 A gnome has started fishing in front of the Roysse Room on Bridge Street. He is saying to Harry "You can watch but don't frighten the fish!" Harry went into the church reception area when nobody was about. 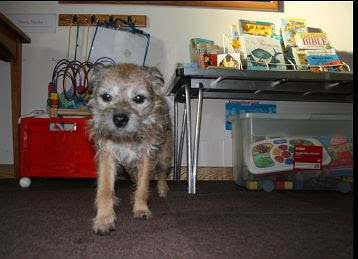 He rolled upside down and scratched his back on the bristly carpet near the door, then explored the children's activity area. But being just a dog he did not go into the Holy of holies. 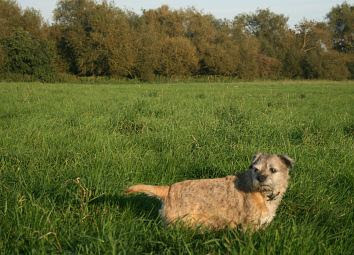 This is harry doing his imitation of a gun dog. Not as good as his bear cub I know. 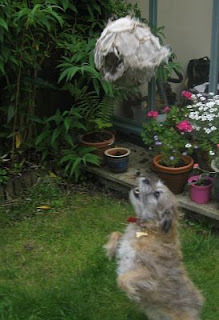 Harry did find a poorly rabbit which just didn't move, but he just stayed by it and did not touch it. 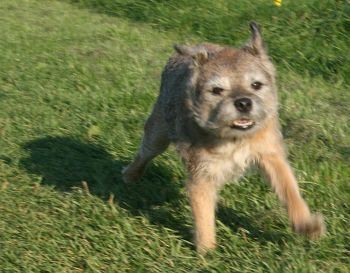 This is Harry doing his best ever imitation of a bear cub. Harry is on the bank edge looking down a six foot drop to Sandford Brook. He used to be able to get down on a sloping path but it has all eroded away so now he can only look. We used to have a Jack Russell called twopence who went crazy when the vacumn cleaner was on. 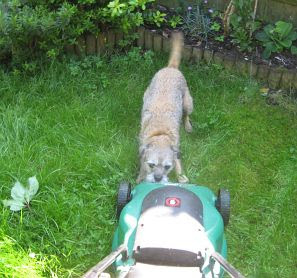 Harry reacts in a similar way to the Lawn Mower. He barks and tries to bite it. Whats it all mean? Well I dunno. I'm only a dog after all. 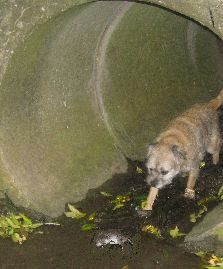 But it seems to me that either you have got paws or you aint. You can't fake them! 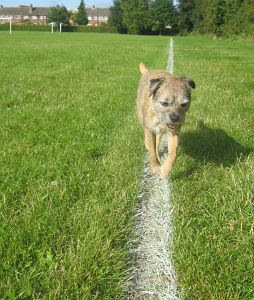 Its a mighty fine line at the Caldecott Rec. Harry likes most ball games. 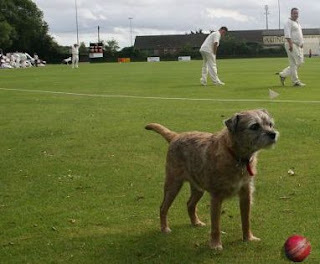 But a cricket ball is too hard to bite, and too big to fit in his mouth. It wasn't my fault. How was I to know! 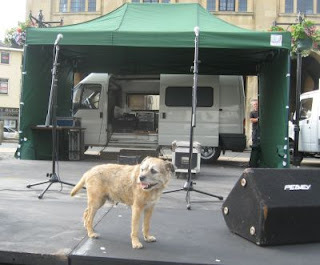 Its a couple of hours before the Abingdon's Got Talent final, and Harry went on stage for his brief fifteen seconds of glory. Harry has had his annual strip as well. 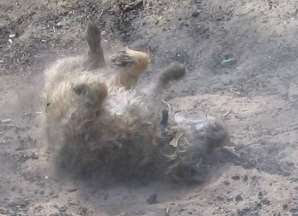 A Border Terrier's hair just pulls out to reveal a strange tidy dog underneath. But it doesn't last long. Soon have the scruffy Harry back. 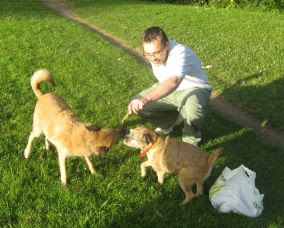 Since Steve closed the shop Harry doesn't see Harvey quite so often but we did meet up today in the Abbey Meadows. Harry supports the well known Abingdon team: Saxton Rovers. But he tends to use his teeth on the ball much too much to have a future as a footballer. Maybe they will let him be mascot one day. 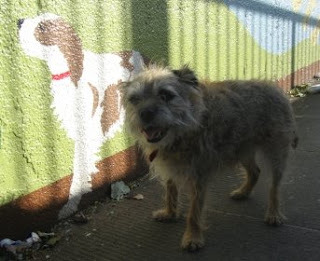 On the Underpass Mural, representing the History of Abingdon, the characters are mostly humans, but there is one dog - a Kings Charles Cavalier. 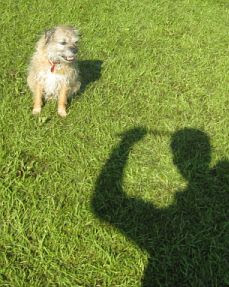 The man with the camera is trying to take a picture of Harry showing excitement at a stick being thrown. Normally Harry will get really excited when a stick is about to be really thrown. Harry is not into posing. Either its happening or its not. 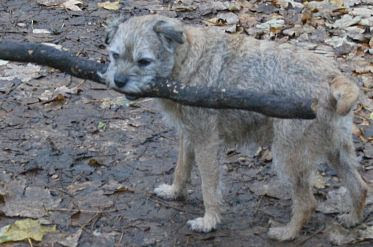 This stick is not. What Harry likes is a good smell wafted on the wind. He'll stop, and turn to have a good sniff around. 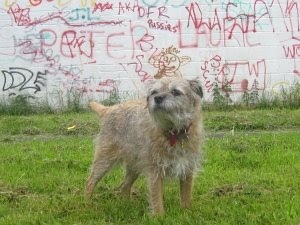 But all that graffiti is frankly way over his little doggy head. It might as well be Shakespeare for the sense it makes to him. 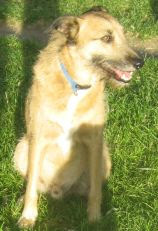 Harry hasn't seen my nephew's dog, Brindle, since he was a puppy. 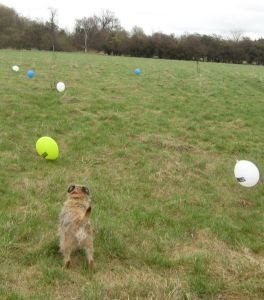 We thought we'de introduce them in the open fields. They ran about chasing each other, and sniffed the same things. But when we got back to a house in a confined space they both went for each other. No damage done. We pulled them apart quickly. To be continued... possibly. It was very hot at the Dragon Boat Racing this year. But lots of the stalls had water bowls for dogs. Harry particularly enjoyed one part of the Abingdon Air and Country Show. 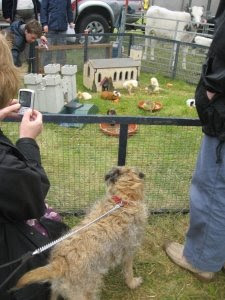 His tail was wagging and he was tembling with excitement as he watched the little ducklings and rabbits and guinea pigs. It was like doggy heaven and he did NOT want to leave. 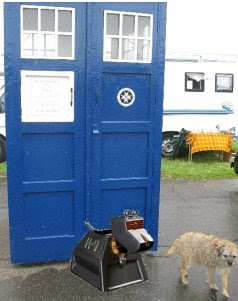 Harry seems a bit unnerved at first by the appearance of the tardis at the Abingdon Air and Country Show. K9 was superimposed after the event. 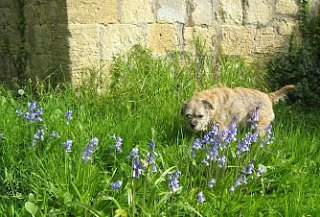 Harry is not just admiring the bluebells, he is eating the long grass. Now what is Harry trying to tell me? 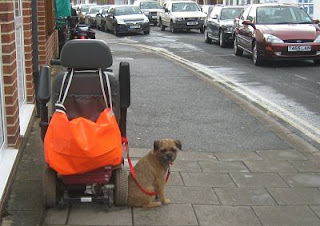 I don't drive a mobility scooter, or go around with a newspaper bag. 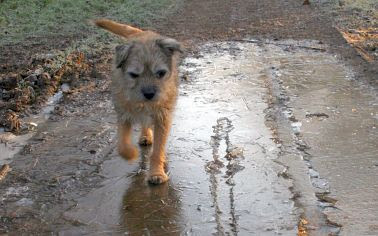 He was running about like a mad thing in the unexpected snow. The only real snow all winter and it came in April. 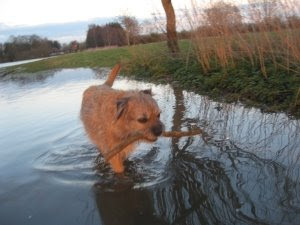 The Thames Path is underwater at the moment so it makes the walk a bit different. 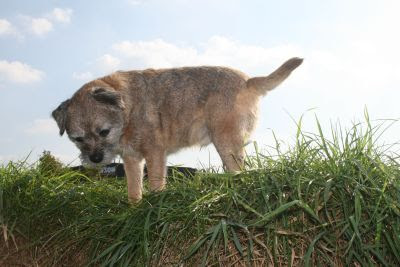 On a windy day like today it would be easy for a small dog to get blown away. 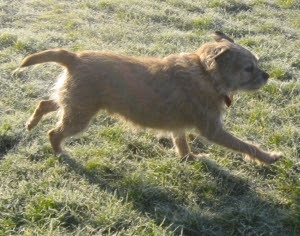 A sharp frost does nothing to stop the Border terrier from running free across the grass of the Caldecott Rec. 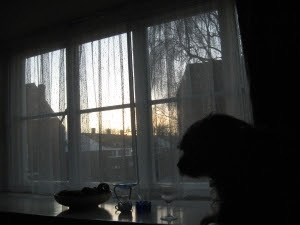 When nobody is about, Harry sits on the back of a chair looking out of the window. Its his waiting place, when the rest of the pack are away. But the moment somebody comes through the door he is off to greet them. 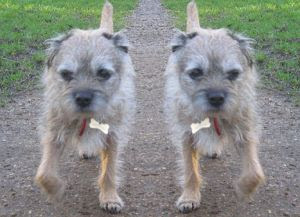 Harry (and friend) doing a bit of synchronised dog walking. 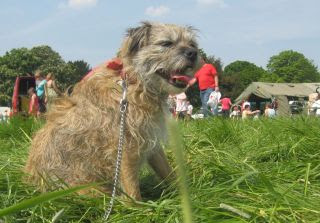 It is not yet recognised as an official Crufts event. But one day their chance will come.